Nugget Nationals is intended to be a friendly, cheap and informal competition in which competitors participate at various sprint events with the goal of achieving the fastest lap time in an inexpensive vehicle. Nugget Nationals is a reaction to the exorbitant spending and modifying that occurs in sprint competition. We at Nugget Nationals believe that supersprint motorsport can be fun and challenging at an economical price point, and that those with a smaller budget should be encouraged to participate. With this in mind we have inaugurated this series, to promote friendly competition and participation for anyone interested in club level motorsport. The series focuses on competition between drivers, with cars and modifications taking a back seat. (a) This document sets out the guidelines for competitors in the series known as and referred to as “Nugget Nationals” for the calendar year 2017. The following personnel are the Organisers and have equal authority on all matters relating to the series. (a) Any person is eligible to participate in the series, however individual licensing and entry requirements will apply for each round of the series as specified by the organiser of these events. (b) Competitors may only enter one vehicle per round of the championship. (c) Multiple competitors may enter an event in the same vehicle, however competitors should be aware that sharing a vehicle between more than two competitors may disadvantage those entrants in scoring championship points due to the format of some events. (a) Each entered vehicle must comply with the Technical Regulations. (b) Multiple competitors may drive the same vehicle. (c) Vehicles may be subject to random scrutiny by the Organisers at any time during an event. When requested entrants must provide documentation demonstrating compliance with the relevant technical regulations, particularly Sections T2, T3, T5 and T6. (b) Not all rounds will be circuit based. (c) Additional events may be added at the Organiser’s discretion. Competitors must enter each individual round through the organiser of that event where applicable, registration for the series does not automatically grant entry to each individual event. (a) Points will be awarded to drivers at each round in order of either fastest lap time or other condition as applicable to the event type. (b) The distribution of points awarded at each round of the championship will be announced following each round. (d) For non-circuit based rounds, points allocated will be uniquely distributed as appropriate to the type of event at the Organiser’s discretion. (e) At the conclusion of the Series the competitor with the greatest number of accumulated points will be declared the winner of the championship. (a) The intention of the technical regulations is generally to limit costs, maintain a degree of parity and encourage regular participation with reliable vehicles. Competitors must keep all records of expenses on a vehicle, as budget may be a consideration for future events. (b) In addition to these regulations each vehicle must also comply with the entry requirements of each individual event. These requirements are the responsibility of each event organiser and may vary. (c) In any situation where a vehicle does not comply with these Technical Regulations due to a modification, existing or otherwise, a competitor may apply to the Organisers for an exemption and that vehicle or modification may be accepted if in the opinion of the organisers it does not constitute a competitive advantage. (d) Where the term OEM is used this shall be defined as: A component produced by or identical in specification to a component produced by the original manufacturer of the entered vehicle intended for fitment to a vehicle complying with T2 parts (a) and (b). (a) Only vehicle models produced in full volume and eligible for road registration in Australia may be entered, this includes vehicles eligible to be fitted with an Australian Compliance Plate, a Low Volume Used or New Import Identification Plate or equivalent only. This does not include vehicles imported and registered through other alternative schemes. (b) For the purposes of part (a) of this regulation, ‘full volume’ refers to a vehicle that was supplied to market complete and in a state ready for registration in numbers exceeding 10 per annum. This excludes kit cars, clubmans, and replicas. (c) Vehicles not complying with part (a) of this regulation may be accepted at the discretion of the Organisers. A competitor wishing to enter a non-complying model must apply in writing to the Organisers. (d) Only models fitted from the factory with an engine with capacity less than 1,500mL swept volume are permitted. The engine must comply with regulation T5. (a) The initial purchase price of the entered vehicle may not exceed $3,000.00 excluding any fees or registration costs. Note that $5,000 is considered to be the absolute upper limit that a vehicle should cost complete and including all modifications, excluding any safety devices, a vehicle exceeding this is not in the spirit of Nugget Nationals. (b) Notwithstanding clause (a), in cases where the competing vehicle was purchased before 01/01/2014 for a price exceeding $3,000.00 the ‘purchase price’ of the vehicle may be taken as the present value as documented on Redbook. In this case the value will be taken as the lower limit of the private price range. Alternatively a different value may be accepted at the discretion of the Organisers. (c) The vehicle must be purchased at a price within or valued within the price cap specified in part (a) in a running or near running condition. A vehicle purchased requiring major repairs or not in running condition will not be accepted within the value limit unless that vehicle is demonstrated as being generally available within the price limit. (a) The following Technical Regulations specify all allowable modifications. If the regulations do not explicitly allow a modification that modification is not permitted. Where a modification is permitted that modification may not perform any other supplementary purpose beyond the permitted function. (b) In general a modification is defined as: any removal, modification, substitution or addition of components. (c) Any factory option for a vehicle model variant is not considered a modification and may be freely added or removed except where it directly contravenes a Technical Regulation. Only options available for the exact model, year and variant are permitted to be fitted or removed under this rule eg. “Nissan Micra LX 3 door hatch” is a model variant and only options available for that unique variant, such as A/C or power steering may be added or removed. Road Vehicle Descriptors as published by RVCS will be used to determine available options. (d) Entrants must provide complete details of their vehicle and modifications to the Organisers prior to each round. (e) Wear and maintenance items may be replaced with components sourced from non-OEM manufacturers, but must be of identical specification, geometry and mass as the OEM item originally fitted to the vehicle. Components complying with this clause are not considered to be modifications. (f) The Organisers will be the final judge of what constitutes a modification. If any doubt exists as to whether any alteration to a vehicle is considered a modification, or if a modification is compliant with these regulations the Organisers should be contacted in writing for clarification. (a) As per regulation T2 the engine capacity must not exceed 1,500mL swept volume. (b) Notwithstanding point (a), allowance is provided for capacities in excess of 1,500 mL in cases where engines, originally displacing less than 1,500 mL, have been rebuilt. However the OEM stroke and cylinder liners must remain and a maximum bore oversize of .060” or 1.5mm is allowed. (c) Any form of forced induction including nitrous oxide, whether originally fitted or aftermarket, is not permitted. (d) Only one engine is permitted per vehicle. (e) Rotary engines are not permitted. (f) Engines must be of internal combustion type, supplementary electric motors are not permitted. (g) Engine swaps are permitted only to replicate a manufacturer’s option or model/trim variant for the vehicle in question, and the vehicle replicated must comply with sections T2 and T3. However any other options or trim differences which were included in the different model or trim variant must be replicated fully, such as more luxurious, heavier interior features and A/C. All engine conversions must be approved in writing by the Organisers. (a) Engines may be rebuilt or reconditioned to the manufacturer’s original specification however all components fitted must be OEM as specified for the particular engine and vehicle model, alternative components to those factory fitted to that particular engine variant in that model are not permitted whether OEM or not. Resizing of crankshaft journals and cylinder bores during the rebuilding of an engine is not considered a modification. (b) The cylinder head and block may be resurfaced but the combined total of material thickness removed from both items may be no more than 0.020”. (d) Engine oil sumps may be modified or replaced to assist oil control. (e) The exhaust system may be freely modified downstream of the mounting plane of the exhaust manifold to the cylinder head. (f) The intake system may be freely modified upstream from the throttle body, air flow meter or carburetor, whichever is the most upstream component. (b) Tyres used must be legal for street use in the state of Victoria as per the Road Safety (Vehicles) Regulations 2009. However tyres worn beyond their treadwear markers are acceptable. (c) Tyres must have a UTQG treadwear rating of 140 or greater. (b) The maximum wheel width permitted is 7”. The maximum wheel diameter permitted is 15”. (c) One metallic wheel spacer with thickness no greater than 25mm may be fitted per wheel. Wheel nuts may be replaced. (d) Wheel nuts must have a minimum of one stud diameter of engagement on the wheel stud eg. an M12x1.5 wheel nut must engage the stud by 12mm or 8 full turns. (a) The following modifications to the suspension system are permitted. (b) Dampers and springs are free, but must use the original attachment point to the vehicle body and to the unsprung mass. Height adjustment using threaded body dampers is permitted, and adjustable spring perches may be fitted in cases where the damper is not concentric with the spring. In the case of macpherson strut equipped vehicles the mounting holes on the vehicle body, strut or knuckle may be slotted to allow camber and/or caster adjustment. (c) Swaybars may be added or removed freely. Modifications may be made to control arms to facilitate the attachment of sway bars, or alternative OEM control arms of identical geometry with provision for sway bar attachment may be substituted. Aftermarket control arms are not permitted to be fitted for this purpose. Brackets may be added to the chassis for the attachment of swaybars. Sway bars may be adjustable. (d) Suspension bushes may be replaced, however replacements must be elastomeric. Metallic bushes or spherical bearings are not permitted. (e) Vehicles may be fitted with one aftermarket component or assembly per corner for the purpose of adjusting, caster, camber or both. Only one part of this type is permitted per vehicle corner. (f) Suspension braces are free, however braces fitted in the interior must comply with section T13. A suspension brace is defined to be an aftermarket rigid link which attaches by bolts to the local area of a suspension attachment point only. Braces not fitting this definition are not permitted unless forming part of a permitted roll cage. (g) Wheel studs may be replaced provided no modification to any other component is required for fitment. (h) Adjustable panhard rods or modifications to panhard rods on vehicles using such items is permitted however bushed in these items must conform with clause (d) above. (iii) Replacement calipers, drums and discs must be of equivalent material type to the originally fitted calipers ie. cast iron calipers may be replaced with cast iron calipers only. (iv) The original mounting location of calipers and rotors to the suspension upright, axle or strut must be used. (v) Attachment brackets may be replaced or modified where necessary to suit an alternative caliper or drum. (c) Brake master cylinders and vacuum boosters may be replaced or removed however the original brake pedal, brake pedal support and mounting, and mounting location of the master cylinder and/or booster to the vehicle body must be used. (d) Dual master cylinder arrangements are not permitted, however suitable adapting plates may be used to fit an alternative master cylinder or booster provided its mounting complies with clause T10 (c) above. Localised modification of rigid brake hoses is permitted to allow fitment of an alternative brake master cylinder. Proportioning valves may be replaced or removed. (a) Gearbox internals may be replaced or rebuilt but OEM components must be used. The originally fitted gearbox housing and complete shifting arrangement must be retained without modification. (b) The clutch pressure plate and disc are free. The flywheel may not be replaced. (c) Limited Slip Differentials are not permitted, OEM or otherwise. (d) Automatic vehicles may be converted to a manual transmission if this configuration was available from the manufacturer. All OEM components must be used as per the manual variant, except where freedoms are allowed in points (a) and (b) above. (b) Localised modification of wheel guards for the purpose of tyre clearance are permitted, re-shaping is permitted but no material may be removed. Modification to or removal of plastic wheel guard trims is permitted. 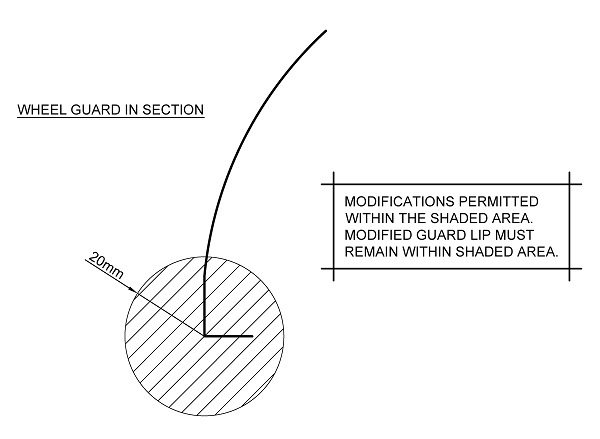 For the purposes of this clause “localised” is within 20mm of the original guard lip, and no part of the guard may be displaced more than 20mm from its original location. See Figure 1 below. (e) Aerodynamic body additions are free. Note that items fitted must be safe and track worthy. These parts must be firmly fastened to the body of the vehicle and not pose a risk to other track users. This includes any potential for debris which may harm vehicles such as screws. This clause does not allow the removal of any item, however localised modification of OEM body parts is permitted to allow attachment of additions. (f) No items may be removed from the body of the vehicle except where allowed in (b), (c) and (d) above. (g) Custom liveries are permitted and encouraged. (ii) All OEM external lighting must function and no removal of wiring is permitted. (iii) Only items not forming part of the basic chassis and designed by the manufacturer to be removed may be removed. (e) In addition to the freedoms in points (b) to (d) above safety devices for the driver only may be fitted without restriction, including seats, restraints and roll over protection. Interior may be locally modified for the fitment of these items, however only the minimum amount of interior material required for fitment may be removed. (f) The following driver comfort items are free: gear knobs, gear shift levers, steering wheels, steering wheel spacers and pedal covers. (g) In cases where vehicles have been purchased with interior modifications not easily or economically reversed then these modifications may be accepted at the Organiser’s discretion. (h) Tools, spare tyres and any associated loose items may be removed as required by the regulations of each individual event. (a) All vehicles must use either commercially available unleaded fuel of no greater than 98 RON, diesel fuel, or Liquified Petroleum Gas. (c) Fuel additives are not permitted, except in cases of vehicles originally designed to operate on leaded fuels which are permitted to use a suitable upper cylinder lubricant.